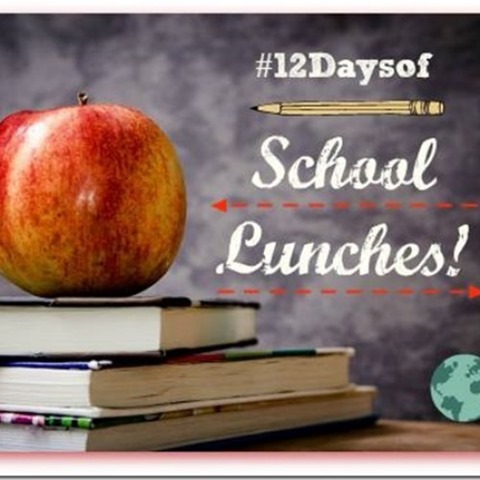 Welcome to Day 10 of our 12 Days of School Lunches! We’ve had so many fun and creative ideas so far, haven’t we? This one follows the basic principle that if you put it on a stick and give them a dipping sauce, kids are going to eat it! Of course, the fact that these “lollipops” taste like pizza doesn’t hurt either. I’m sharing a couple different ways to prepare them so you’re likely to find one that your kids will just love. 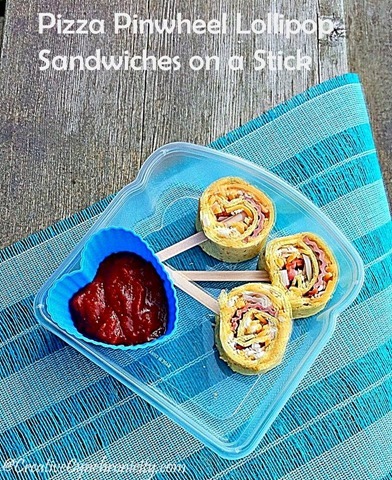 They make awesome after school snacks or appetizers for a party too! For this no cook option, you need tortillas, pepperoni (or ham, pineapple, any other pizza toppings you like), grated cheese, cream cheese (I used plain but what about using pineapple cream cheese with ham or herb and garlic cream cheese to spice it up a bit? ), craft sticks or coffee stir sticks, and pizza sauce for dipping. It’s as simple as this – spread some cream cheese on a tortilla. It acts as the “glue” to hold the other ingredients. Want to make it even healthier? Substitute fat free cream cheese or hummus. OR whip up some cottage cheese in your blender to make it smooth and spreadable. Sprinkle on some grated cheese and whatever other toppings you want to use. Roll up the tortilla tightly. I found it helpful to wrap it up in plastic wrap and put in the fridge for at least an hour to help it hold its shape. Even better? You can wrap this up the night before and then simply finish in the morning before school! When you unwrap it, slice into 1 inch wide sections to form spirals. Poke a stick into each one to make the lollipop shapes. Send with a container of pizza sauce for dipping. You need tortillas, grated cheese, pizza sauce, and whatever pizza toppings your child likes. Spread sauce on the tortilla and top with the grated cheese and your toppings. Roll up the tortilla tightly. Place on a baking sheet and put in a 400 degree F oven for about 5 minutes, until the cheese melts. When cool enough to handle, cut into one inch slices and poke sticks into each spiral to make the lollipop shapes. Send as is or with a container of additional sauce for dipping. My daughter likes these with ranch sauce for dipping instead! Be sure to check out all the great ideas for school lunches on the linky below.